Chocolate Almond Butter Granola Bites are the afternoon pick-me-up you need to see you through to dinner. 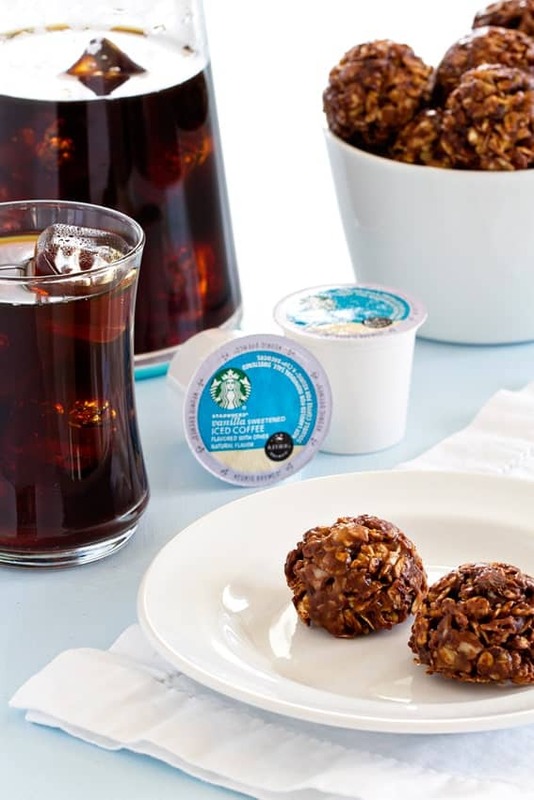 Along with a Starbucks® Iced Coffee K-Cup® Pack in Vanilla Sweetened, you’re set for an afternoon of productivity! I’m finding myself getting up super early these days. There’s just something about that early morning quiet that speaks to my soul. The baby and the husband sleep soundly, so I can putter around the kitchen, baking up goodies (like Lemon Rasberry Scones) and making my to-do list for the day. It makes for a quiet, productive, and organized start to my day. Something I’m finding makes all of us happier. Elle’s one lucky little girl that both Mama and Daddy work from home, but it certainly requires some dedication on our part to make sure that work is a priority too. I mean, who can resist those sweet smiles, you know? That’s why waking up early is working so well for me. But let me tell you, when 3 o’clock rolls around? I am wiped. If I’m going to make it through dinner, an evening walk to the park, bathtime and putting a toddler to bed, I have got to have some extra sustenance to get me through. 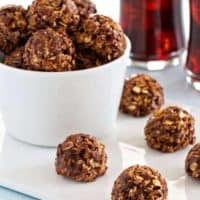 That’s where the idea for these Chocolate Almond Butter Granola Bites come from. Just a couple of nibbles of one of my favorite flavor combinations and I am on fire once again, ready to bake some more, play some more, or write a few blog posts. But only so long as I’m also sipping on a refreshing iced coffee. 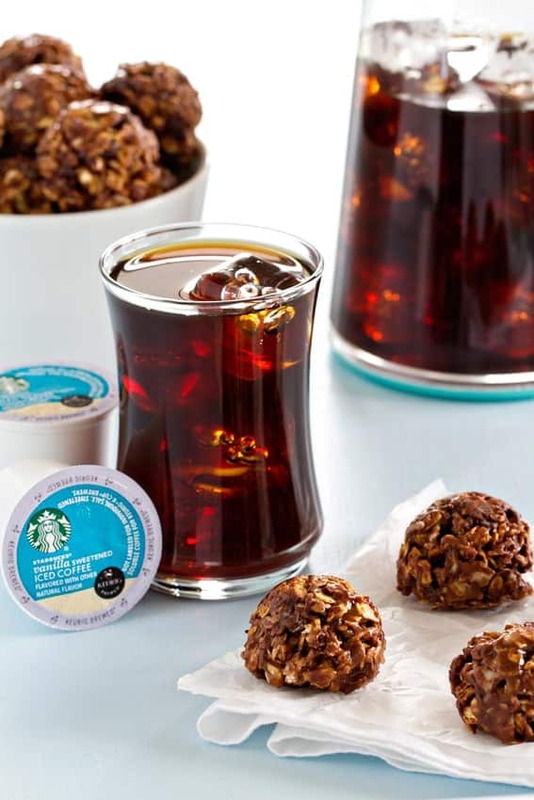 I’m totally crushing on Starbucks® Iced Coffee K-Cup® Packs in Vanilla Sweetened right now, and it’s the perfect flavor pairing with these granola bites. These little bits of yumminess are perfect for sticking in your work lunch box if you work outside the house, or you could use sunbutter in place of almond butter if your kiddo has a nut-free school, and send them along in the lunchbox too. These granola bites are also incredibly adaptable. You can also mix in your favorite dried fruits like raisins or cranberries and swap out the nuts you use. The delicious possibilities are truly endless. Sipping on a vanilla iced coffee with a nibble or two has become my new favorite afternoon tradition. I take a few minutes out for myself from the busy work and parenting day. Taking stock of what I’ve accomplished, and what I’d like to do with Elle for the rest of the day is usually what I’m thinking about, but it gives me just those few extra minutes to breathe and take it all in. Are you taking a moment in your day to appreciate what you’ve accomplished? I sure hope so! 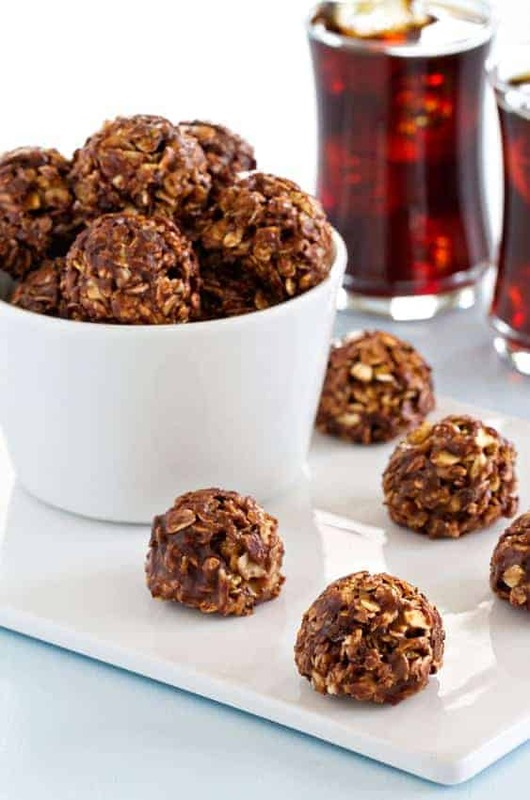 Chocolate Almond Butter Granola Bites are the afternoon pick-me-up you need to see you through to dinner. 2. In a small saucepan over low heat, stir together the honey, almond butter and butter. Stir constantly until smooth and warm, about 2 minutes. Remove pan from heat, stir in vanilla and allow mixture to cool for five minutes. 3. While the honey mixture is cooling, stir together the granola cereal, rolled oats and chocolate chips in a large bowl. Pour the cooled honey mixture over the oat mixture and stir until thoroughly combined. 4. Using a medium cookie scoop (1.5 tablespoons), scoop granola mixture and place granola bites onto prepared baking sheet. Refrigerate granola bites for 30 minutes to set. If your granola cereal has large clumps, be sure to break up the clusters to create an even texture. Granola Bites will store in an airtight container within the refrigerator for up to 5 days. I am definitely making these this weekend. Perfect little portions of yummy-ness! I hope you do get the chance to try them. Thanks for visiting. I love having snacks like this on hand to power through the afternoon slump! I think I need these not only as afternoon snacks but for breakfast on the go as well as I usually do not have enough time to make and eat breakfast before going to work. Will make them this weekend! Thanks for sharing! these look delicious, crunchy too (which I love)! Will give them a try! I hope you get the chance to try them! Thanks for visiting. I think the cookie butter would work fine but I haven’t tested with it. Let me know how it turns out if you try it. Thanks for visiting. Oh my! I made these yesterday and they are delicious, I can’t stop eating them! I made them with peanut butter since that’s what I had at home and they turned out wonderfully! Thank you for the delicious recipe! We’ve made them with peanut butter too, Jessica and they were sooooo good! Enjoy and thanks so much for stopping by! Hi, may i know what is “almond butter”? Almond butter is like peanut butter, but it is made with almonds.